Golden Apples: Hey, Remember This? 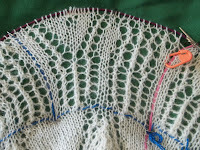 Once again, I am working on the Peacock Shawl! 4 incredibly long rounds done—3.5 last night, and the final half round this morning. I had to stop last night because my fingers were cramping—and I dropped, in quick succession, 2 stitches. Both of them were recovered—but I didn't want to push my luck. See there, on the left? The feather motif has its eye (a small 5 in 1 increase) and the right half of the motif is just beginning the base (of stocking knit) for its eye (to come in future rounds) The next 10 rounds have more increases than decreases—and I have already broken the 1,000 stitch per round barrier! 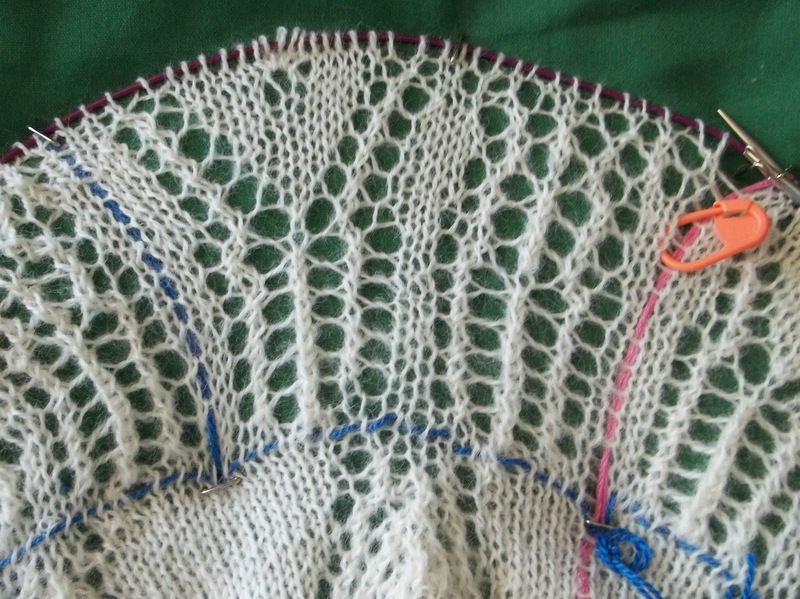 The last 20 rounds of the motif are a bit of relief—there will be some net decreases, and the rounds will shrink to a mere 720 or so stitches per round! There aren't a lot of increases in the first few rounds of chart 4—but really that getting way ahead of myself! I just need to slog through these 1,000+ stitch round, and keep making progress. So the blog content will slowly once again return to knitting. Without hours spend sewing, there will be time for knitting... and knitting content! That will start bright and early Monday morning—What with Sunday being NY's Stitch N Pitch game –The ESPN game of the week! The Met's vs. the Cardinals—but even a sports illiterate like me knows, ESPN called it wrong—Last night game was the Met's game of the week, of the year, of the franchise! The Met's has a PERFECT game--(a no hitter)-- the first in the teams history. (I should remember the pitcher's name—Sanchez, I think—but well...I am just not that big a fan) This should build excitement for the next few games, ya think? Well, we'll have to wait and see how tonights game goes—and then see if Sunday's third match up between the Cardinal's is a big hit. (Monday is the final in this series of games). I'd much rather be going to next weekends match up--(a Subway series—with the Yank's vs Met's) I live in Queens, but at heart, I am a Bronx gal, and my home team plays in the Bronx, not Citifield. This year's Stitch n Pitch will have a bit of display and shopping experience on the concourse (OK, so its one of the nose bleed section concourses) and I'll be there, with most of the Sunday's at Panera's crew—Nancy, Debbie and Jessica. It's going to be a blast. I won't be knitting the shawl--though I might get some done today, and early tomorrow before the game--and have some progress to show. I will be working on May's secret socks--it's June already, and time for them to be done, and June's socks to be started! I haven't yet settled on what June's socks will be... I love all the sock club kits I have made up--it will be a last minute decision.